Consumers will adopt and use convenient services and products. In mobile, this translates to services that offer immediacy and simplicity through a highly contextual experience. The ability to deliver highly contextual experiences will evolve in sophistication with technology in the phone. Imagine the buying and selling opportunities that will emerge when phones can make size, color, and scent recommendations. eBusiness and channel strategy professionals must leverage context to deliver the right information at the right time to the right place to increase conversions. 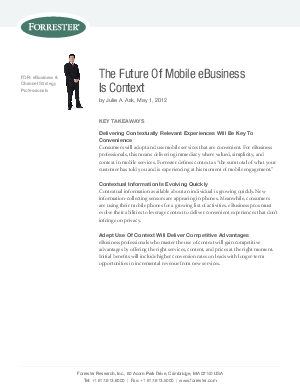 This report, an update to "eBusiness: The Future Of Mobile Is User Context" originally published on July 11, 2011, outlines the future vision of Forrester's solution for eBusiness and channel strategy executives working on their mobile eBusiness strategy. It maps the evolution and the key driving principles eBusiness professionals should follow to maximize their opportunity within this rapidly changing and transformative space.